An awesome coral swim through on Punta Sur Reef, Cozumel. Wow, what a name for a dive site! I conjure up in my mind steaming hot water vents and giant tube worms with a miniature bathysphere watching over us as we descend to one thousand feet! The glow of red hot lava illuminates the dark as reach the bottom of Devil's Throat! Well, it was exciting, but not quite this exciting. It probably is, though, the best coral swim through on the planet. Leaving the boat, the visibility was so good we could see the white sand bottom 70 feet below as soon as we began our descent. I was really impressed with the size of the coral heads. As we reached bottom, they towered above us like buildings. Everything is big down here! gorgonians, sea fans, plumes and whips were all extra large, and really impressive. 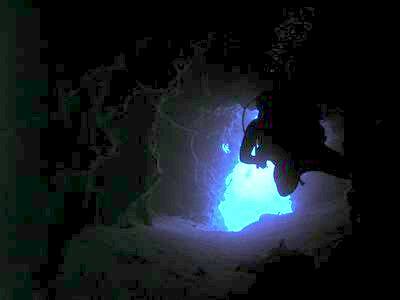 We watched the dive master search for the entrance to Devil's Throat. Nestled between coral bulges and hugging the sand, a little indentation was the modest portal to this huge coral tunnel. 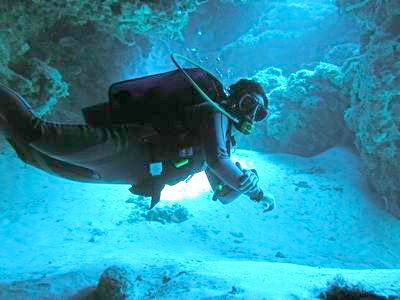 Suddenly, our dive master disappears and we hurry to follow, not wanting to be left behind! The daylight glow fades, and we are surrounded by an inky blackness as the walls close in. This is exciting! Slowly we follow each other, our eyes quickly adapting to the dark. This "throat" is a huge tunnel through the coral, averaging about six feet in diameter, allowing plenty of room for comfortable navigation, as we twist and descend down its slanting sandy floor. The actual tunnel is only about 60 feet long, starting at a depth of 70 feet and ending on the side of the coral drop off at a depth of about 130 feet. 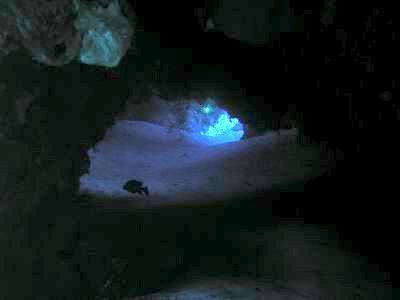 In several places, smaller "window" tunnels travel off to the sides, admitting a glow of daylight to illuminate the dark interior of the "throat". Spellbound by this ethereal realm, I almost forgot I had my camera with me! Snapping a quick shot, the camera strobe pierces the dark with its intrusive, stabbing flash. I fumble to turn off the flash, trying to hold my little dive light under my chin so I can illuminate my camera settings LCD panel. With the flash off, I snap a few more pictures, and the natural light gives awesome exposure, and a real feel of the deep, dark, mysterious sense of adventure this moment holds. Slowly we approach the end of the throat, and the glow of daylight begins to increase. 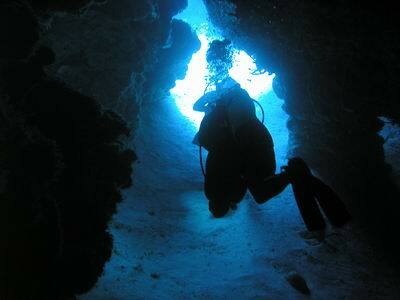 The tunnel enlarges, and we emerge on the slanting side of a huge coral drop-off. I check my computer, and see we are at 128 feet. I can tell my breathing rate is increased, the excitement definitely has my pulse up. Looking around, we get our bearings, and check out the little opening from which we have just emerged. It seems to have disappeared, as it blends into the massive coral formation. 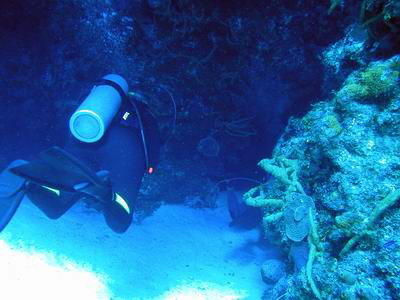 Our dive master is hovering nearby, and he seems to be enjoying the dive as much as the rest of us. 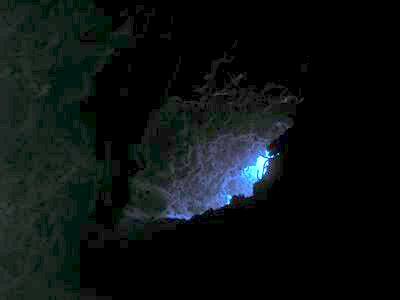 Beyond him, the bottom slopes down on its plunge into the blue abyss. For a moment, I change the settings on my camera, and when I look up, everyone's gone! 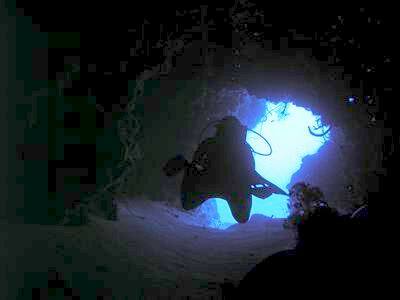 I guess our dive master meant it when he said we would start our return the moment we got to the end of the throat! Swimming up, I see the fins of the person in front of me disappear into a different tunnel that snakes back up to the level from which we descended. Swimming quickly, I catch up and re-enter the coral head. The beautiful white sand coats the bottom of the tunnel, and looks like the carpet in a king's hallway. More little window tunnels admit just enough light to give this labyrinth a spellbinding quality of illumination. The blue glow of daylight blends into the blackness with a thousand shades of night. Each shadow hides its own intrigue, and my eyes linger on every feature. 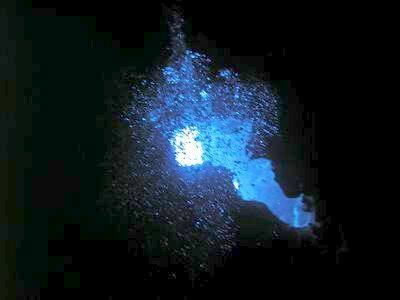 The bubbles float graciously upwards, tickling and tracing their path over the coarse walls and ceilings of our cavern. Like a thousand tiny creatures, they swarm in unison as though they were alive, on their tumbling rush to the surface. 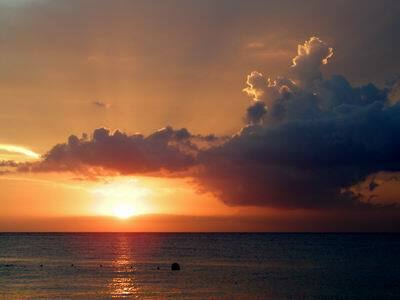 The daylight reaches towards us as we emerge from our cocoon of coral and sand. All too soon we are back at the 70 foot level from which we descended into this Devil's Throat. The coral heads continue to surround and tower over us like buildings, but the sense of openness brings relief and a feeling of calm. The light continues to weave its magic spell as we drift through this coral canyon. 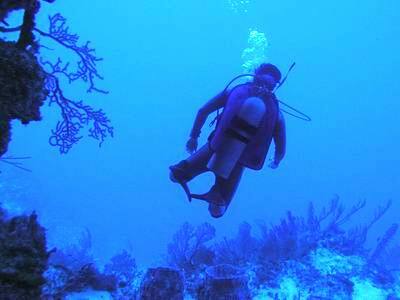 Our dive master serenely glides along like one of the marine creatures that surround us. The tension of the Devil's Throat has given way to the blissful tranquillity of our drift. I become deeply aware of the fantastic beauty and majesty of this place. A deep satisfaction and sense of well being fills my mind, and I am keenly aware of how fortunate I am to be at this place, at this time. This is not a vacation, this is a communion with mother nature that rejuvenates my soul. This is a point of connection between my life and the world that will fix itself in my consciousness forever. This, this, is why we dive. My reverie continues as our dive brings us in contact with three more beautiful sea creatures. 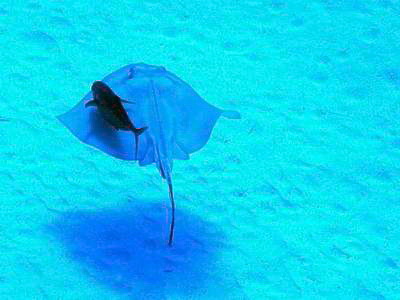 Swimming directly under us, a bar jack turns black as it shadow-feeds with a southern stingray. 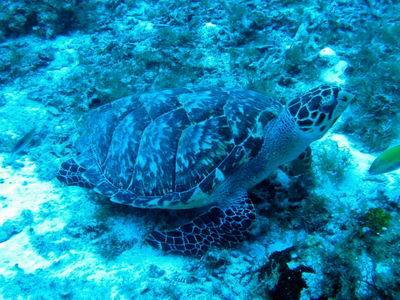 A minute later a hawksbill turtle lazily lifts its head to watch us swim by. 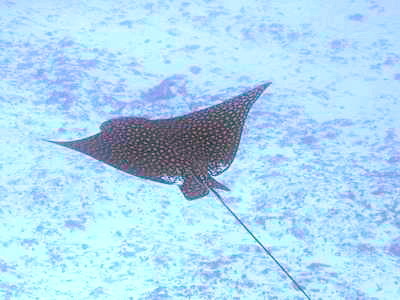 As we begin our ascent, a spotted eagle ray glides below us with silent majesty. We had decided to do a double safety stop on this deep dive, so we hung out at 40 feet for a few minutes, before moving up to the usual stop at 15 feet. Another group of divers just behind us are doing the same thing, and a million bubbles hang in the blue water. This has been an awesome dive, and it now holds as many memories as there are bubbles. When we arrived back at the dock, another gorgeous sunset was in progress. We rinsed our gear and stowed it in our lockers, and sat on the shore to watch the show. There would be no green flash tonight, but a thousand golden hues accented by dark clouds and silver linings was certainly a longer show. Below are the comments that were originally posted by users of the Trip Report section of the Rodale's Scuba Diving web site. 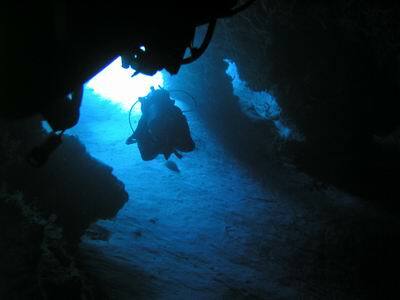 (www.ScubaDiving.com) I've copied them from that section of the board, which is no longer functioning in the same format. One of my favorite sites....thanks for returning me there. Great report and writing. I felt I was there. Really enjoyed it. Thanks for the pics. I've done that dive several times. One of my all time favorites. Can't wait to do it again! Aaaahhh. I feel better, now. Thanks. Excellent report. I hope do do this one some day. Wow, great pics and readings. I thought this was excellent! As Rod Stewart once sang...Every picture tells a story. Nice job! Wow - you captured it in words *and* images. One of my favourite dives of all time. Thanks for sharing. Well written with excellent images taken in a difficult setting. It's just the way I remember the dive from last September. Nice write up and good pictures!!! 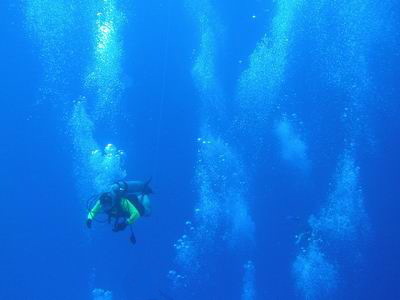 You captured that otherworldly feeling of an exceptional dive. Made my morning! Great writing & pics! 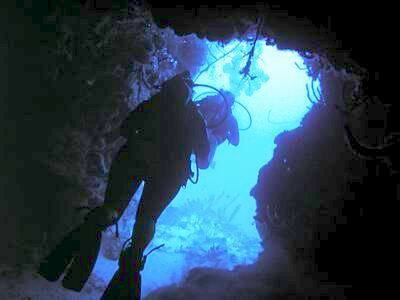 Loved the dive - hope to do it myself next trip to Coz! Thanks!